If you look at our Pinterest board, you'll see that I have a lot of items in a style I call "Granny Chic". Granny chic is colorful: think vintage paintings, quilts, and afghans. It's the idea of decorating with old items, but mixing them with modern ones. Granny chic really needs to be used with a light touch. It can get really tacky, really fast. Too much, and you could feel like you're sitting in a granny's house that hasn't been decorated since the 1960's. You could have flashbacks to mothball scents. But if done right, Granny Chic can be oh-so-chic! I headed to the thrift store recently to look for goodies. I had in mind quilts and afghans. For some reason, I can never have too many throw blankets. I love them. I found these zig-zag afghans. The first one in the above photo was felted. It had been washed and dried too many times and wasn't soft. The third one in the photo had great colors, but also several holes. The middle one: Came home with me. It was 3 bucks. Our farmhouse has all of the original woodwork, crystal doorknobs in every room, and this great set of glass French doors that lead to the parlor. 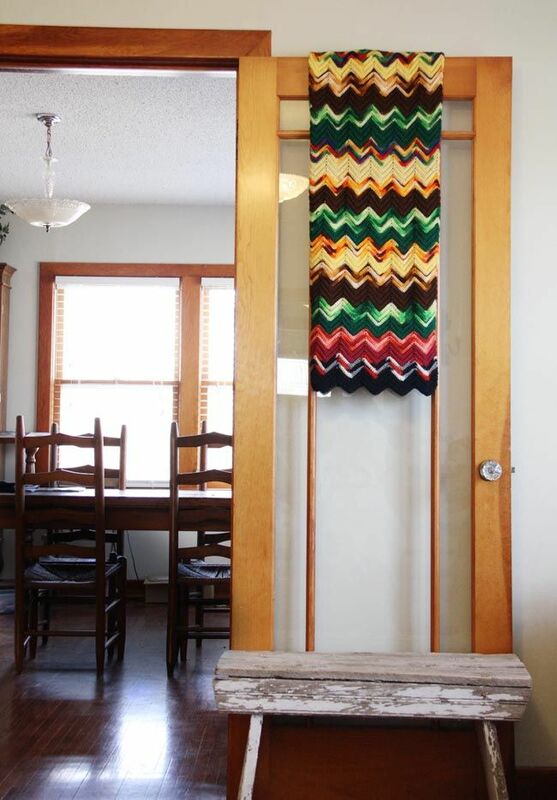 We leave them open all the time, but I love draping a blanket over one to add a pop of color to the room. In the summer, I use a red white & blue quilt. Instant 4th of July decor. 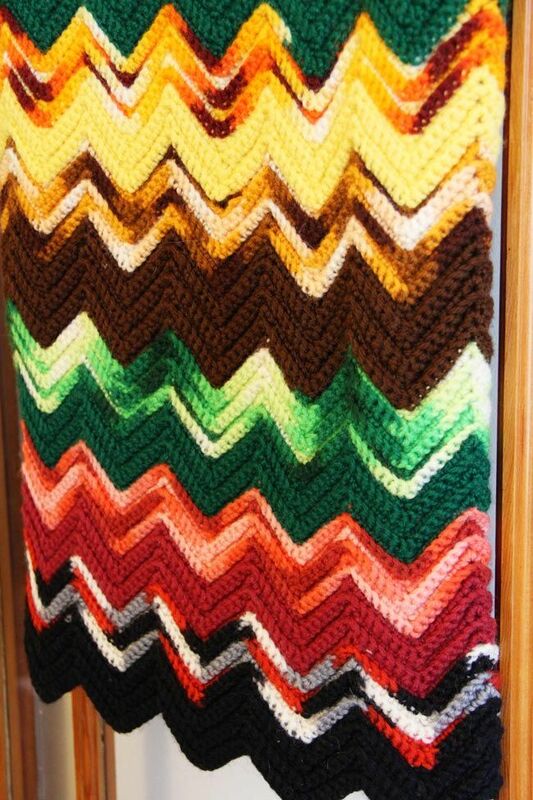 I really would have preferred the classic "Granny Squares" pattern, but this zig zag pattern reminded me of Missoni. Remember the craze when these zig zags hit Target recently? 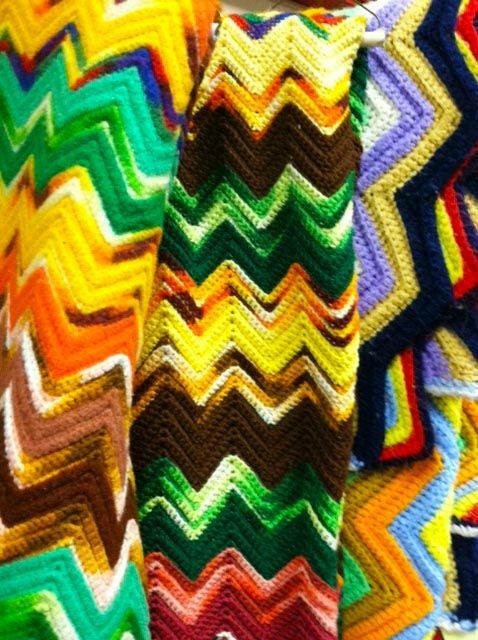 Grannies were into this zig zag chevron trend long before we were! i call my style...coastal cottage farmhouse vintage :) it took me a while to finally figure it out! happy monday to ya beki!! I'm loving that blanket over the door look! I looked at those exact same afghans. I loved the way the felted one looked, but not very soft and inviting. I love to knit and then felt things, but not to wear or cover up with!! whoa. that looks amazing and normally i wouldn't say that because of those colors (some are outdated, in my opinion). I have several of these and this is the pattern that my Mom taught me how to knit. Love the way you display yours! Ooooooooooh I like! So country, so chic and so awesome. I like to call my style "poor, pathetic and exhausted." I saw your post title and all that went through my mind was how do you know my grandmas? My husband's family calls their grandmother's "granny chic" - and because he's got both a grandmother and great-grandmother still tormenting the young ones... they actually call them the "Granny Chics." I don't have much of a decorating style, just grandkid friendly and comfortable, I guess. I have one of those granny ripple afghans that my sister made for me right after my first son was born, 38 years ago in June. WOW time flies.